Water or other non-alcoholic beverage, quick to eat foods and lunch that does not require refrigeration. There are very few locations opportunities to purchase food or beverages. Full-fingered gloves, closed back, with no holes in them. They must be street-motorcycle specific and/or durable leather. Mechanics gloves, batting gloves, etc. are NOT acceptable. Sturdy high top shoes or boots, footwear MUST COVER the anklebone; fabric footwear is not permitted. Long, sturdy pants; leather, “blue-jeans,” or denim only. HELMETS are provided as part of the course. 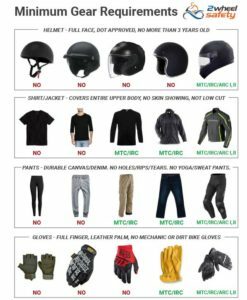 Your own full face DOT approved helmet may be worn. If it does not have a face shield, you will also need glasses or goggles to protect your eyes. There will be a written exam at the end of the classroom session. There will be a riding exam at the end of the second day of riding. There are no guarantees that you will pass and there are no refunds. This policy applies even if you leave before the course is complete, whether the decision is yours or made by the Instructor. Our goal is to keep you and others safe. Following successful completion of both exams, completion cards will be issued. Within 10 days you will be mailed a DMV completion certificate required to apply for your motorcycle license. You must be on time! The state program prohibits allowing students to enter the class after the session has started. Select the course and location on the Registration page. We offer the course WEEKENDS 48 weeks a year.